Hello there ladies and gentlemen, as promised I’ll be running more and more giveaways on this blog. 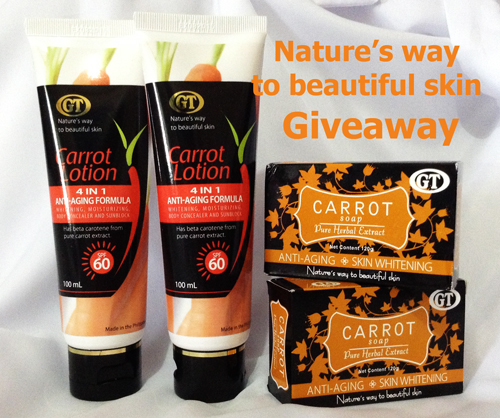 Today, we’re so lucky that GT Cosmetics, the makers of GT Carrot Lotion and Carrot Soap is so generous and is about to let you experience that ‘nature’s way to beautiful skin’ by way of sharing their natural 4-in-1 anti-aging formula Carrot Lotion and Carrot Soap in this giveaway. I have tried these products myself and I must say I’m surprised and overwhelmed at how good these products are. I have posted my GT Cosmetics Carrot Lotion Review here; you can run through it but don’t forget to enter your chance to be one of the three winners of 2x100ml Carrot Lotion and 2x120g Carrot soap. This giveaway is open to Philippine residents only, however, if you are residing outside of the country and would wish to join and is lucky to win, I’d be more than willing to ship it to your specified address. This giveaway will run from September 16 – October 7, 2013. Winners will be published shortly after entries are verified and will be informed accordingly. In cases where winners can’t reply in 72 hours after the notification, another winner will be drawn. Thank you so much GT Cosmetics for making this giveaway possible. Woman Elan Vital proudly supports ALL-FILIPINO products. I want that anti-aging product! That's a great giveaway, Verns! I love natural products. I never try this product,yet. I hope to try if given a chance. oh what a bummer, oh.. i can still join right if i could send it to my mother in my philippines address? i haven't tried carrot lotion and carrot soap but would love to. Being in a country where women are so vain, there are so many soaps and lotions to try... i hope to try this one though. Wow Carrot lotion? Something new that I'd love to try! Me too is surprised to know that there is Carrot Lotion? All eye know is carrot is good for the eyes. I love carrots; raw and cooked, smoothie and all, hope I can try these soaps and lotions as well...carotene is good for the eyes di ba? but, I take a multivit that's good for the eyes, nails and hair - it has carotene too, makes sense! My mom has used the carrot soap and she really loved the result. Though I was hesitant at first to try this product, I just gave in to my mom's persuasive personality. She forced me to try it. I just started using it... I do hope one of these days, I see some nice results. hehehe! I am male but I tried their soap especially the carrot soap. But now, I'm sticking to Nivea Men products. And yes, they're made in Cebu. My sister prefers their soap because it works for her.